The wives, the affairs...I'm surprised Rudy never tried to be a rock star. But clearly he's driven by a strong desire to get laid. On the plus side, if elected he will inevitably provide more fodder for proof of Republican hypocrisy on the issues of marital fidelity and their favorite bogeyman, Bill Clinton. Unfortunately, we have to list Huckabee here again, as the man has a documented history of lining his own pockets. Of course, these are the Republicans we're talking about, and really, any and all of them could be listed under here as well. If Fred were any lazier, he'd be sending his PA out to do his whistle-stops and stump speeches. Given his recent performances, this might actually be a better campaign strategy: Build the Myth. His campaign has seriously tried to pitch him as viable because he "looks and smells Presidential". He entered the race late and even his own campaign team has to remind him he needs to actually try to get elected. His extraordinarily harsh stance on illegal immigration places him squarely in the "wrath" category, pushing out Alan Keyes. He actually gets even angrier that other Republicans get anywhere near his fury about illegal immigration, and accuses them of trying to "out-Tancredo Tancredo". McCain was a contender here, but his wrath is all the "sound and fury, signifying nothing" type. He talks tough, but watching him hug George W. Bush and endorse him after all the campaigning and having the Bush campaign label him as mentally unstable...well, it's all an act. McCain is as truly wrathful as Grandpa Simpson. Dana Carvey's "Grumpy Old Man" is has more honest wrath than McCain. Also more entertaining. Tancredo, on the other hand, got in a screaming match with Karl Rove. Keyes ran for President in 1996 and 2000. Obviously didn't win. He also ran for Senate in 1988, 1992, and 2004. Didn't win. He was detained briefly during the 1996 campaign when he tried to force his way into a debate to which he hadn't been invited. Always the bridesmaid, never the bride. I hate to break it to you Alan, but you're not going to win this time, either. Romney's feeling that he is "one of the chosen" comes through in every picture, speech, and public appearance. He is convinced that he is better than all of us and will not rest until he is literally ruler of the entire world. A recent New York Times article documented his annoying compulsion to "top" any statement anyone else made, even if he had to lie to do it. The irony is delicious. Seven Deadly Dwarves. Does that make Hillary Clinton the Snow White in our increasingly tortured analogy? Today I got up at 6 am to fly to New York for work. I have air travel down to a science - at this point I just have it totally dialed in. I know how long it takes to drive, park, check in, stand in line, etc. I can cut it close now. I have my "travel clothes". My pre-packed bags ready to grab and go. I know exactly how much metal I can wear through the detector. I can take my shoes off, doff my coat, and whip my laptop out of my bag faster than most people can pick up one of those gray bins. It's like ballet. Walking through that space with my headphones in, I am basically the embodiment of every ad in Wired or Fast Company. "Living the dream", flying from SFO to JFK on a hot new airline with a Timbuk2 bag full of the latest in digital music technology so I can go talk to people at MTV. It's ridiculous and marvelous. I wonder how I got here, living in this entirely designed experience? I flew Virgin America today. They leave out of SFO's International terminal, which is a beautiful place. Almost a totally different airport - marble floors, clean walls, lots of light and space. Not too crowded. Beautiful minerals exhibit outside security. I took a gypsy cab into the city. Must be the medication I'm on - I would never normally do that and only wondered if I'd end up dead in a ditch once! So I'm at the W. Another heavily "designed" experience. Dark hallways. Mood lighting. Downtempo music. Modern room furniture. Like Target, these experiences constitute a layer of design pasted over what is essentially a "budget" experience. 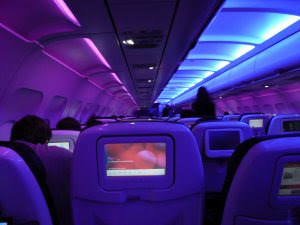 Take away Virgin's fancy lighting and techno music and you have, well, JetBlue. Or Southwest. Visiting the "W", one starts to think it's so damn dark because it hides the stains on the carpet and the poorly-finished room corners and bathroom fixtures. Turn up the lights, turn off the looping downtempo CD playing when you enter the room and you're basically in a Marriott Business Jail with "modern" furniture instead of traditional American Hotel Awful. And in Times Square, that "budget" experience is still north of $600. Even if living in design is basically the same as living without, it's more fun. One of my close friends has an inoperable brain tumor. Another family member had a brain tumor discovered and removed in the last 30 days and is in recovery. One of Iran's classmates, a young woman, has breast cancer. Surgery, chemo, the works. One of my co-workers died several weeks ago after a lifelong battle with cancer. One of my team members' significant other is being treated for Hodgkin's lymphoma. Today I found out that the mother of some dear friends has breast cancer and is going into surgery in 2 weeks. In college I was a DJ on Dartmouth's NBC-affiliate radio stations. My first show I paired up with another Freshman - Jeff Macke. We did a crazy/awful thing called "The Party Show" and broke all kinds of rules and go in all kinds of trouble. Back in those days, this drove me crazy. 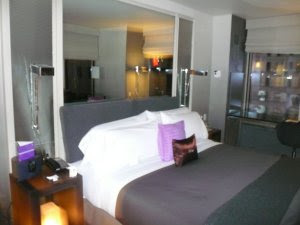 I'm in New York, at the W. It's about 25 degrees outside and snowing. So I'm doing cardio on the elliptical machine. At the W they all have these little TVs-on-a-stick in front of them. Mine is off. But the one next to me had this MSNBC show on called "Fast Money". I glanced over at it and nearly fell off my treadmill. Jeff Macke is now a TV star. He does financial commentary. Jeff also used to run a successful hedge fund, which he eventually shut down because he realized hedge funds are bad deals for the customer. Jeff was always a very kind and thoughtful guy. Glad to see he's doing so well. I knew Jake Tapper, too. He used to draw cartoons for the school newspaper.